As my sister’s car disappears over the top of the hill, her faint toot in farewell tells me she has turned onto the main road. The dust settles on our lane as I look to the pile of boxes she just left behind. When Mother died last year, Dad gave up the summer house. “Come and take what you want, girls,” he had said to us, and we did. I chose the tall secretary where Mother sat so often writing letters by a sunny window. Beth chose a painting of the summer house itself. Ellen picked a statue of horses, for she and Mother had shared a love of riding. After the moving van left with the things that Dad wanted, my sisters and I had lingered in the cottage going through drawers full of old letters, boxes of slides, albums of faded photos-the collective memory of a family. We had put it all into a dozen boxes and each of us chose four. Now Beth dropped off my boxes; Ellen’s house is her next stop. I sit down on the top step of the porch and open a box marked “Albums.” Here are photographs of my father, resplendent in his Navy uniform, and one of my mother leaning against their first car. There is the faded picture of the family gathered for my christening, the women elegant in hats and gloves, the men’s faces shadowed by their fedoras. As I slowly leaf through the pages, the family grows, we buy our first house, the cars get bigger. Then, there on the last page, is the picture of us in our sister dresses. I can almost feel the starched ruffles and hear the rustle of the crinolines that were needed to keep the skirts nice and full. I remember Mother’s delight when she found these dresses at the children’s shop in the village. There was one in my size and one for Ellen but no size four for Beth. We were so excited when Mrs. Page, the shopkeeper, told us she felt sure she could order one for Beth that would come in time for Easter. When the big box arrived in early April we gathered around Mother as she lifted the dresses out one by one. The pink tissue paper rustled as she held each one up. They were made of clouds of dotted Swiss organdy with blue-flocked dots. 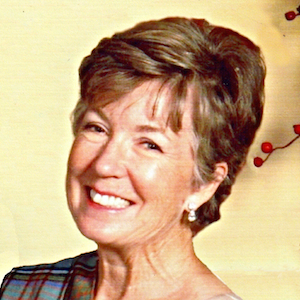 The skirt and collar were trimmed with tiny blue bows. “To match your eyes,” Mother had said. We were allowed to try them on just once so that we could have a “fashion show” for Father that evening. As we twirled into the dining room in our new finery, he burst into applause. 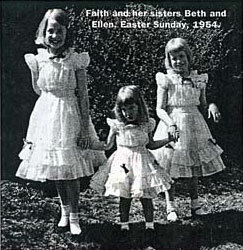 Ellen and I daintily grasped the ruffled skirts and executed our best curtsies; Beth scrunched her dress up in her chubby little hands and made a close approximation of one, almost toppling over in the process. Then we had to carefully hang our finery up until Easter Sunday. As I look at the photograph, I can recall the warmth of the pale spring sunshine on our faces that day. We undoubtedly resisted putting on coats to go to church. They surely would have crushed those beautiful dresses and besides, how then could anyone have seen how wonderfully we matched? In time, I handed my dress down to Ellen and she handed hers down to Beth. Finally, only Beth had one of those beautiful dresses, its bow a bit bedraggled after countless wearings by three little girls. But those dotted Swiss dresses were only the beginning of a long parade of matching sister outfits. Mother obviously was so pleased with the effect that she began an Easter tradition. I remember the year of the blue calicoes and the year we all had matching yellow jumpers. Even Father got into the spirit of things when he came back from a business trip to Arizona with Mexican dresses for each of his girls–even Mother.Those wonderful white dresses with rows and rows of bright ribbons edging the wide collars and hems had skirts that were cut in a complete circle. Father put Ravel’s Bolero on the record player and we spun madly about the living room, our beribboned skirts fluttering like crazed butterflies. At last we crashed, giggling, into a heap. Dad, quite pleased with our reaction to his gift, sat in his armchair and grinned his “that’s-my-girls” smile. Gradually, as we grew older, I think Mother saw how very different we all were becoming and just stopped buying us matching dresses. By the time we were in our 20s, our lives were on three very distinct tracks. Our wardrobes clearly reflected our different worlds. Mother would shake her head in bemused bewilderment and say to Father, “How did we get three daughters so different?” He would merely smile. Though our lives have continued to run along different pathways, the circle draws closer as we grow older and once again realize how similar we are. Now we are all mothers, equally challenged by our various roles. And although our wardrobes still differ widely, we all seem to be moving toward variations on “classic.” Last Christmas I gave all the women in the family silk blouses. Same style, different colors. Everyone loved them. Mother didn’t realize what a tradition she started. When my own daughters were little, I often made them sister dresses. When I was expecting my third child, I made myself a maternity dress out of some bright pink cotton. Eleanor, my elder daughter, loved the fabric, so I made a jumper for her out of the scraps. That baby turned out to be a girl. So, in a way, my daughters’ sister dresses started even before birth. For as long as I can remember, Dad had always given Mother a beautiful nightgown each Christmas. They were long and silky with plenty of lace. When we were little, we used to love to stroke their satiny smoothness. With Mother gone, we knew that tradition would stop. Christmas was bittersweet this year. The tree certainly sparkled, but there was no big pink box from “Sweet Dreams” beneath it. We put on happy faces for the sake of our children, but all the little touches that Mother always added to Christmas were missing. Suddenly Ellen drew out from behind the tree three identical white boxes. On the lids, written in Dad’s bold hand, were the words “From the Nightie Gnome.” We opened them and lifted out three identical red flannel nightshirts. We whooped with delight as we pulled them out of the tissue paper, then ran down the hall to put them on. When we came back into the living room to show off our sister nighties, Dad had put Ravel’s Bolero on the stereo. We joined hands and did an impromptu dance. As the music grew louder, we twirled around faster and faster–ignoring the widening eyes of our disbelieving husbands and the gaping mouths of our children. I smile now at the sight we must have made: three grown women dressed in red flannel nighties whirling madly through a jumble of empty boxes and wrapping paper. When the music ended in a clash of cymbals, we crashed, giggling, into a heap. Our husbands shook their heads in wonder. The younger children nearly keeled over with embarrassment while the older ones held their sides with laughter. Dad just smiled his “that’s-my-girls” grin. Copyright © 2005 Faith Andrews Bedford. All Rights Reserved. Copyright Faith Andrews Bedford © 2016. All Rights Reserved.